The Supervisory and Team Leader Aptitude Test assesses the aptitude of employees or candidates for Supervisory and Team Leader positions and are suitable for both selection and development purposes. The Supervisory and Team Leader Aptitude Test is best suited to the grade of supervisor, team leader or any position involving the use or application of budgets, policies, or moderately complex procedures within an operational setting. 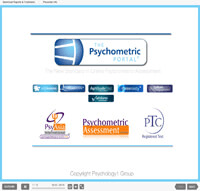 The Supervisory and Team Leader Aptitude Test is administered online via The Psychometric Portal®. Immediately after the candidate has completed the test, a report can be produced. The Supervisory and Team Leader Aptitude Test can be administered under supervised conditions or remotely, online. If you have not supervised the candidate’s completion of the test, you may wish to use Validate at a later stage to verify the candidate completed the test without assistance.